The same problems that plagued Ohio State in its past two losses traveled to Iowa City, Iowa, for Saturday’s game against Iowa. Sophomore forward Kaleb Wesson recorded two fouls in the first three minutes of the game and was sent to the bench with only a turnover to his name. He ended the half with two points and one rebound. The Buckeyes recorded 11 turnovers in the first half, coming into the game averaging 11.87 turnovers per game. The same mistakes were too much for Ohio State to overcome in its 72-62 loss to Iowa, the third straight after falling to then-No. 8 Michigan State and Rutgers. It marked the first time in head coach Chris Holtmann’s tenure his team had had a losing streak of at least three games. With a one-point deficit to overcome, the Hawkeyes came out of halftime with an offensive burst, helping propel them to their victory with a 12-3 run. Sophomore forward Luka Garza accounted for seven of those 12 points. He finished the game with a team-leading 16 points. Iowa shot 55.6 percent from the field in the second half, recording 22 of its 36 total points in the paint. Ohio State finished the game with 21 turnovers, exceeding the season high set against Illinois on Dec. 5, allowing the Hawkeyes to score 18 points off those turnovers. Senior guard C.J. Jackson, who has shot 34.8 percent from the field and 30.8 percent from 3 in his last two games, came off the bench against the Hawkeyes for the first time since Dec. 4, 2017. In Saturday’s loss to the Hawkeyes, he had 10 points, making 3-of-7 from the field. 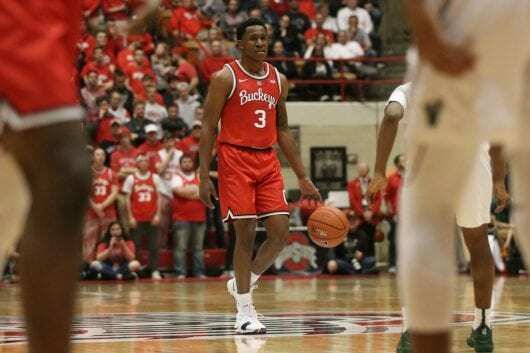 Wesson, coming in as Ohio State’s leading scorer, finished the game with two points and five rebounds after being limited to 23 minutes of playing time after recording four fouls. Junior forward Andre Wesson finished the game with 13 points, a team high. Despite the carelessness with the ball in the first half, the Buckeyes traded shots with the Hawkeyes for the majority of the first 20 minutes, with neither team taking more than a four-point lead. Sophomore guard Musa Jallow helped Ohio State to its largest lead of the game, hitting two 3s on consecutive possessions for his first points scored since Dec. 5, missing seven shot attempts in 47 minutes of play in that span. He finished the game with eight points, making 3-of-6 from the field. With 1:16 left in the first half, freshman forward Justin Ahrens hit a 3, sending the Buckeyes into the locker room with a two-point lead. In the first half, Ohio State played all 10 of its scholarship players available. By the end of the game, every Ohio State scholarship player played at least 10 minutes. Ohio State will return home and take on Maryland at the Schottenstein Center at 6:30 p.m. on Friday.